Community Service is providing both a sewing education for the community and offering sewing items to give to organizations who need assistance. There is always a need for more member involvement in coordinating and/or participating in community service projects. Columbia River Sewing covers a large metropolitan area, which means we can enhance the community in many ways. Please feel free to contact Community Service if you have community service ideas or would like to participate in a community service project. Volunteering your time means you get to choose how much time you can give to our group, and if life changes your availability, it’s all very flexible—there are no signed contracts or commitments! Projects can be taken on by individuals, or as a neighborhood group. Fold fabric in half. Along long sides stitch 1/2″ seams. The top edge may be finished, serged, or pinked with shears. Finish by adding a “Made With Love” label to the lower right corner of the bag. Set iron to wool-cotton setting, press 5 to 10 seconds, no steam. Sign the label with your name using a permanent marker. Contact Megan Garvey for labels. In 2012, the ASG national community service project was the Blanket Project, with chapters donating locally. Randall Children’s Hospital at Legacy Emanuel hospital was designated as the recipient for baby blankets made by our members. Though no longer a national project, we have continued to make blankets. Sizes: minimum side 28″, maximum 36″, need not be square. Designs: (1) Two equal pieces sewn right sides together, turn thru a gap in the seam, slipstitch the opening, topstitch around. (2) Self-mitered with two unequal fabric pieces; see video. You are welcome to use up scraps to piece one blanket side or practice your machine quilting. Do have at least one side baby soft and cuddly. 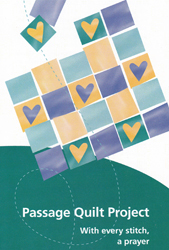 The Passage Quilt Project (PCP) at Providence St. Vincent Medical Center is another ongoing project. PCP is an effort to comfort terminally ill patients and their families. Volunteers create Passage Quilts for actively dying patients. QUILT is an acronym for Quiet, Understanding, Individuals, Lives, and Transitions. A patient’s family members select a quilt from those available. Stitch pre-cut quilt top kits or donate a quilt top of your own creation. To request kits, contact member Deb Henry.